Looking for a fun challenge? Grab your ISC stamps and play along in this month's challenge and you could win Mini Suitcase FREE! So, what's the challenge? 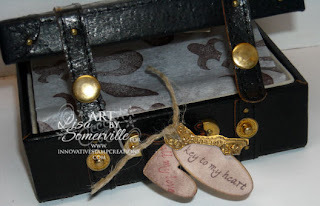 Simply create a Valentine's Gift using ISC images only and leave a link on the ISC Blog Challenge Post with a link to your project by February 8th, 2009. 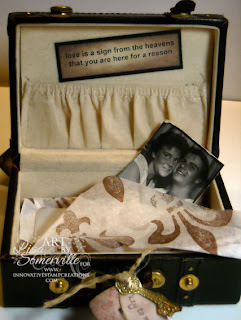 The DT at ISC had the challenge of creating an altered project using these great Suitcases! 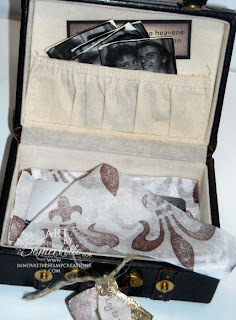 This makes such a wonderful altered gift! 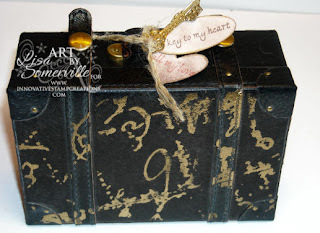 To decorate the outside of my suitcase, I Gold Embossed using the Distressed Script. 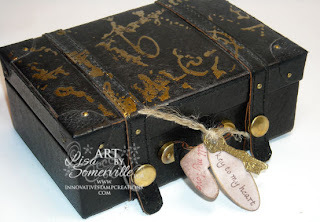 I stamped sentiments from Assemblage and punched with my Heart and Small Oval Punches, then aged them with Chocolate ink. The Key is also from the Assemblage Sheet, here I used the Faux Metal Technique, then pierced all three pieces and tied them onto my suitcase using a piece of hemp. The sentiment stamped on the inside of my suitcase (you can see this once the photos - circa 1986 are removed) is also from the Assemblage plate. I thought it might be fun to stick them inside the pocket of the suitcase - but it's also a great place to stick a gift card or a love note. To jazz up the inside a bit more - I stamped my image from the Photo Negative Plate in Chocolate Chip on tissue paper - once the tissue paper is removed, it reveals the gift card. This would also be a good place for some Chocolate's! Be sure to stop by the ISC Blog and check out the other creations by the Design Team. Oh my gosh! I can't believe no one has commented on this. It's WOWOWOWOW Fabulous! Love the pic too GF!